The goal of this tour is to introduce you to the magical world of kayaking. No previous kayaking experience required. Together with your instructor and your fellow paddlers we walk through and practice the basics of kayaking. 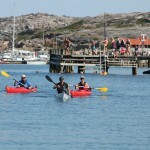 We paddle close to land sheltered by the archipelago suitable for the premiere tour. Kayaking is a magnifant way to experience the ocean and the nature. During the tour we practice entrance/exits, balance, paddling techniques and capsizing for those who would like to do so. Besides the new skills you acquire, you get a chance to get to know more paddlers and get an first hand experience of the magical world of kayaking. You do not become an expert on this tour, but you achieve the basic skills that are necessary to paddle by yourself or self guided tours with your friends. 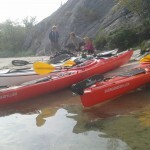 We meet up at the kayakcenter and collect the kayaks and the equipment. Down at the beach we teach the basics in teory and adjust the kayaks for you. We practice safe entrance and exists and paddling techniques. We practice our new skills by paddling out to a island nearby, where we do a short break before we turn back. The tour also offers demonstration and practice of kayak rescue and how to board the kayak if you were to capsize. Please, bring water, sunprotection, swimwear, swimshoes,, extra clothing in drypack. This course is equivilant to the european paddle pass level 1. If you would like to examine and purchase a paddel pass please let us know.